Dutch citizen sues Benny Gantz and IAF commander over the death of his relatives during Operation Protective Edge. 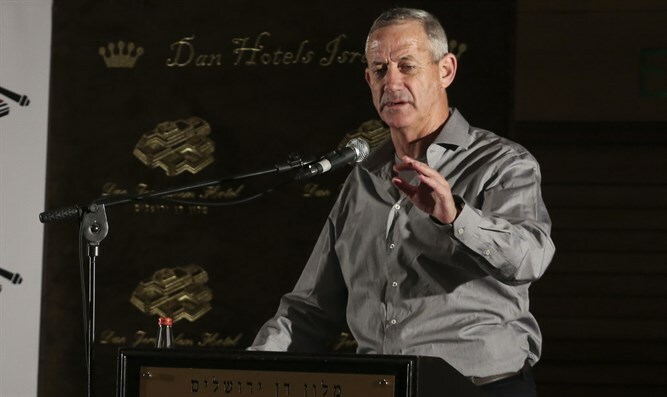 Civil proceedings have begun in the Netherlands against former IDF Chief of Staff Benny Gantz and the commander of Israel’s Air Force, Amir Eshel, over the deaths of six family members in Gaza during Operation Protective Edge in 2014, Haaretz reported Wednesday. According to the report, a preliminary notice of reliability was sent Tuesday to Amir Eshel and Gantz. Ismail Ziada, a Dutch citizen, notified the officers of his intention to sue over the deaths of his mother Muftiah, 70, three of his siblings – Jamil, Yousef and Omar, Jamil’s wife Bayan and their 12-year-old son Shaban. They were killed when a bomb struck their house in Al-Bureij on July 20, 2014. The notice was sent by email to the Defense Ministry and by courier to the Israeli embassy in the Hague, according to Haaretz. The proceedings were also reported in an investigative television program on public Dutch broadcasting, which aired a segment on the Ziada family. In the notice, Liesbeth Zegveld, an attorney with the human rights lawyers firm Prakken d’Oliveira in Amsterdam, is asking Gantz and Eshel to inform within six weeks if they accept liability in this case and are prepared to compensate her client for the damage done to him. Bombing the house and deaths of the family contravened international law and constitutes a war crime, Zegveld wrote in the notice. Financial compensation is not the goal, Zegveld told Haaretz, but the law requires a material expression of damage for a law suit to be filed. Their working assumption, she added, is that neither officer will acknowledge their responsibility. The next stage will be to summon them to appear before a civilian court in the Netherlands. The writ of summons will be accompanied by a description of the case, more detailed than that of the notice of reliability. It will also address and challenge the announcement of the Military Advocate General (MAG) about closing the case of the bomb raid in which the Ziada family was killed. A press release dated August 2016, on the Military Advocate General Corps website said that the house served as an active command and control center for Hamas, and that the attack was designed to hit it and the terrorists manning it. The Ziadas claim the release was never delivered directly to them. Technically, after the court registers the writ of summons, it will schedule a date to hear the parties before a Dutch civil judge, whose job will be to decide whether the Dutch court has jurisdiction. The killing of the Ziada family received special attention when Henk Zanoli, a relative of Ismail Ziada’s wife, returned his medal from Yad Vashem honoring him as a “Righteous Among the Nations” to the Israeli embassy in The Hague in protest of the family’s deaths.